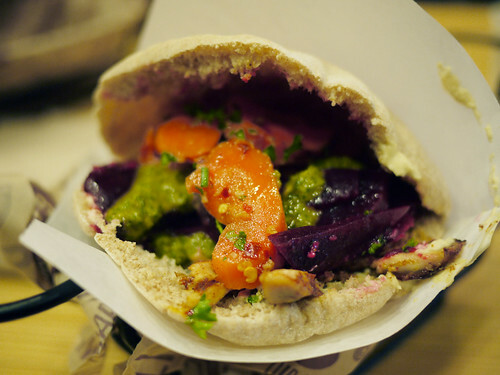 LUNCH STUDIO: Hummus Pita and Co. I was originally very skeptical of this new chain, however I couldn't resist their free falafel sampling they were aggressively handing out when they first opened. And to my surprise it wasn't all bad! Soft fresh pita, clean hummus and a decently spiced falafels. And once I read their review on Serious Eats NY, I knew I had to at least try it. I think of them as a Mediterranean Chipotle; similar concept of build your own sandwich/bowl consisting of fairly fresh stuff. They need to work on the economy of movement in their production line so that it can move faster. But aside from that, this place has good potential to be successful, we think.